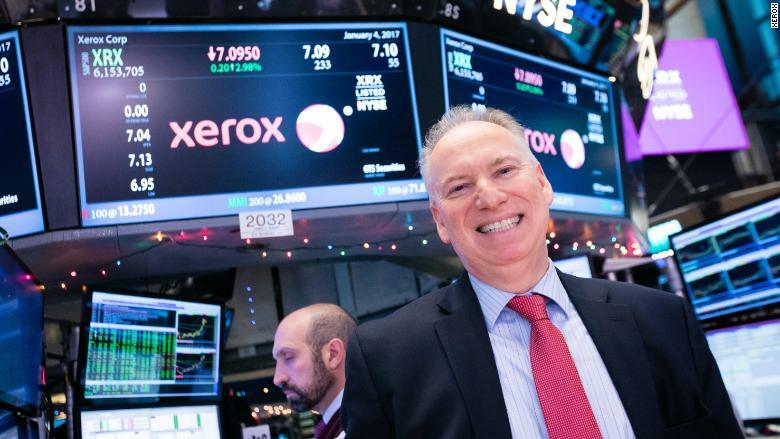 Xerox said late Thursday that its CEO, Jeff Jacobson, is staying, two days after announcing he was stepping down. A couple of days ago, Xerox said its CEO was resigning. Now, it says he's staying put. In a statement late Thursday night, Xerox (XRX) said that a deal with activist investors Carl Icahn and Darwin Deason for its CEO and most of its board of directors to leave had expired. The US printer and copier company accused Deason of failing to fulfill part of the bargain, which required him to end litigation against Xerox directors. Icahn and Deason quickly fired back at the Xerox board in an open letter, saying the directors "recklessly refused to follow through with the leadership and governance changes we agreed to, demanding unprecedented additional approvals for their own personal self-interest." The activist investors have been pressuring Xerox to oust Jacobson and call off or renegotiate a planned merger with Japan's Fujifilm (FUJIF), which they argue would be the "death knell" for the US company. The bitter dispute appeared to have been resolved by the settlement announced Tuesday, which followed a court ruling last week that temporarily blocked the merger with Fujifilm. After hostilities erupted again Thursday, Icahn and Deason said, "We will continue our fight to rescue and revitalize Xerox, as so many of our fellow shareholders have been encouraging us to do." Fujifilm said earlier this week that it had "serious concerns" about the settlement between Xerox and the activist investors. The company said it believes the Xerox board "has an obligation" to stick to the deal the companies agreed in January, adding that it will appeal last Friday's court ruling that halted the merger. Under the plan that Xerox and Fujifilm announced in January, the US company's operations would be merged with those of Fuji Xerox, a joint venture between the two firms. The multibillion-dollar deal would leave Fujifilm holding 50.1% of Fuji Xerox, with Xerox shareholders owning the rest. Icahn and Deason argued that it "dramatically undervalues" Xerox. The two investors, who together hold around 15% of Xerox stock, accused the company's board of overseeing "the systematic destruction of Xerox." -- Jethro Mullen contributed to this report.